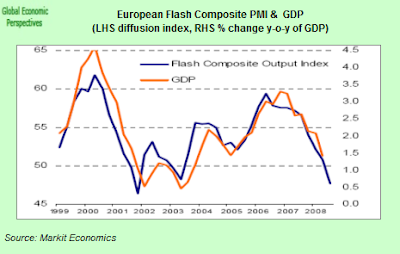 Economic Resources: "There Is No Deflation Threat In Europe" - Jean Claude Trichet - Oh Really! He's at it again. Last year he was trying to worry us that inflation was all set to get out of hand among the 16 countries who make up the eurozone. 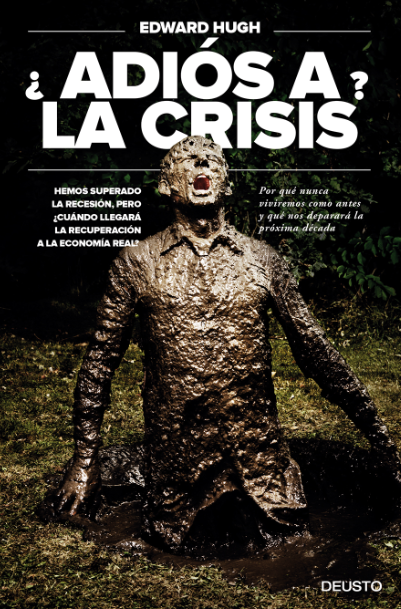 Now the President of the European Central Bank Jean-Claude Trichet is busy trying to convince us that these same countires are facing no credible deflation threat. Apart from getting it wrong on both occasions, the common point here would be a certain inbuilt "inflation bias", a bias which was earlier called "the original sin of the Bundesbank" by nobel prize winning Italian economist Franco Modigliani. Apart from manifesting a spectacular lack of economic judgement, the Financial Times's Banker of the Year in 2007 forces us to ask the question just how "out to lunch" can you get and hold down your job, and come up with answer "bastante" (quite a lot). A quick look at the data shows us that Eurozone inflation is already significantly undershooting the European Central Bank’s target - which is to keep the annual rate “below but close” to 2% - and by all appearances is about to head straight off into negative territory. 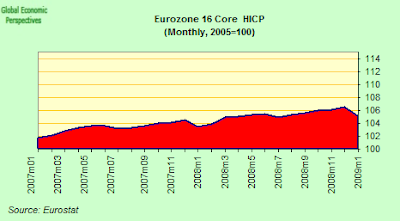 If we look at headline HICP inflation on an annualised basis, we will find that it fell more than expected last month to 1.1 per cent, according to Eurostat, down from a peak of 2.7 per cent in March last year. This was the lowest level since July 1999, and a sharp drop from the 1.6 percent rate registered in December. On a month-to-month basis, prices were down 0.8 percent. The "core" inflation rate - that is consumer inflation without the volatile elements of food, energy, alcohol and tobacco - we find it still stood at 1.6%, since the biggest impact on headline inflation comes from the decline in food and energy costs. 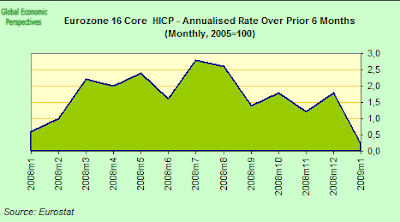 But if we look at the monthly movement in the core index, we find that it dropped by a very large 1.3% (see chart below). 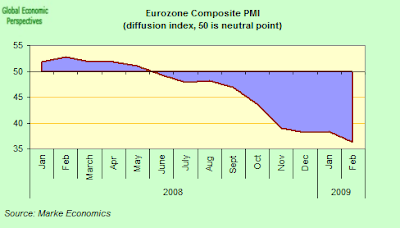 There are further reasons to anticipate a sharp downward pull on prices from some countries in the zone (like Spain and Ireland), since they have housing and construction nooms which are in the process of unwinding, and the only way they can recover the competitiveness they have lost is by conducting a sharp and significant downward revision in prices and wages (since in a currency union there is effectively no currency to devalue). 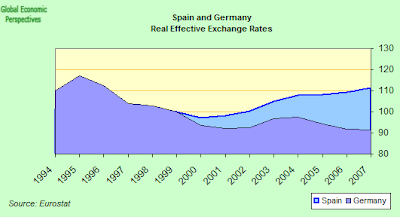 The two charts below show the loss of competitiveness experienced by the Irish and the Spanish economies (respectively) with regards to the German economy since 1999 as measured by real effective exchange rates. 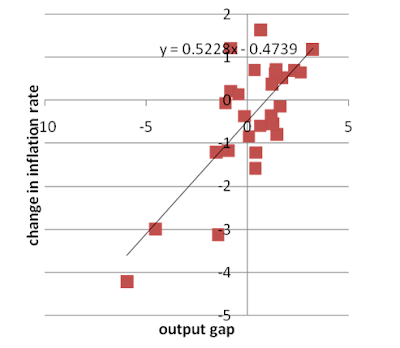 Now the eurozone being a common currency area presents us with specific problems in the context of deflation since, as the Irish economist Philip Lane argues a member of a currency union comes up against a natural limit in national-level deflation. 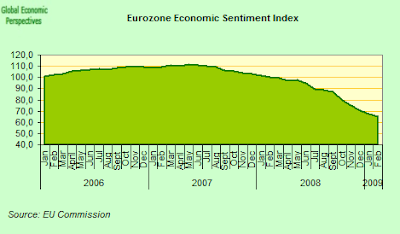 Thus, he argues, while a country like Ireland may well face a sustained period of inflation below the euro area average (such that it may be negative in absolute terms for a while), the situation should tend to be self-correcting since the deflation implies an improvement in competitiveness, which should generate a boost in export driven economic activity and, over time, a return to an inflation rate at around the euro area average. I'm not sure that this argument is 100% valid, since sufficient internal demand lead deflation can so effect household and corporate solvency that debt deflation can at least send a country off into a decade long correction before the price level falls sufficiently to generate sufficient export activity to offset the decline in domestic demand and enable balance sheets to recover. But still, leaving that rather theoretical point aside, there is a more concrete reason for worrying about what is happening at the moment in the eurozone, and that is that the benchmark country, in this case Germany, may be about to see internal price deflation which is every bit as sharp as the fall in prices which is taking place in those economies which are supposed to be correcting vis a vis Germany itself. 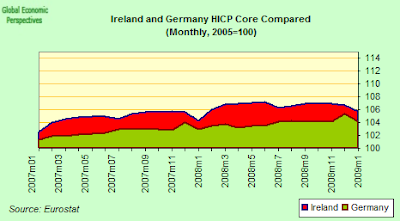 If we look at the two relevant charts below (for Spain and Ireland) we will see that in each case core indexes are falling more or less in line with the German one. In fact, both the Spanish and the German indexes are unchanged over the last six months, the Irish one is down 0.5%. 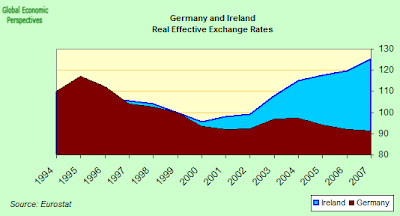 At this pace (1% a year) Ireland would recover its 1999 comparative position with Germany in around 30 years. But the point here is not that prices are falling in Ireland and Spain (they have to do this) but that prices are also set to fall in Germany, and this is where monetary policy from the ECB becomes vital, since if Germany is allowed to fall into deflation then it will be extremely difficult for Spain and Ireland to "correct" (the drop in wages and prices would have to be sharp indeed) but also monetary policy from the ECB would be in danger of becoming a complete mess. Of course not everyone on the ECB governing council shares Trichet's rosier than rosy view, and in a comment that offered an insight into how at least some ECB council members are thinking, Mario Draghi, Italy’s Central Bank Governor said recently that “the governing council is keeping a close watch on the real cost of money”. What he means is that, if Spain's 1.5% drop in core prices over the last three months turned into a 6% annual drop, then the real rate of interest currently being applied would be around 8%, which would constitute a very tight monetary policy in the context of Spain's worst recession in living memory.